Twenty months in dry dock will end Saturday, May 21, when the carrier Theodore Roosevelt checks out of Dry Dock 11 at Newport News Shipbuilding (so nice to be able to use the simple name again, though we should note that the yard is a division of Huntington Ingalls Industries …) to a pierside location for the remainder of its 39-month refueling complex overhaul. The hull actually got wet again beginning on May 16, when the shipyard flooded the dock for testing. 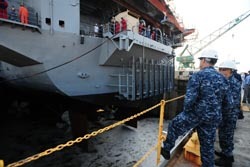 When the ship actually becomes fully afloat Saturday, the short trip to the pier will be TR’s first “underway” since it entered the shipyard in August 2009. Since then, the Navy says the ship’s shafts, propellers, rudders, anchors, catapults and arresting gear machinery have been replaced or refurbished. So far, TR sailors have put in a ton of work. They’ve completed more than4,500 individual refurbishing and rehabilitation tasks and expended more than 1.15 million man-hours of labor, according to TR Chief Engineer Cmdr. Gunter Braun. The crew is scheduled to move back aboard next year. 8/09 until 5/12, some sailor could have spent his whole tour on board a ship not even in the water! This 25 year old CVN now receives another 25 years of life serving our Navy. Let’s hope some 25 year old EXOCET missile isn’t fired from the back of a 25 year old pickup truck by a 25 year old coward parked next to some hillside near an ocean. It might take the crew 25 hours to put out the fires from a hit by the 25 year old ASCM, and then take 25 days inport to repair the damage. Probably at a cost of $25 million dollars, too.